Having had several enquiries about ‘large green blobs’ in a week Ian Evans thought a short explanation about them would be useful. 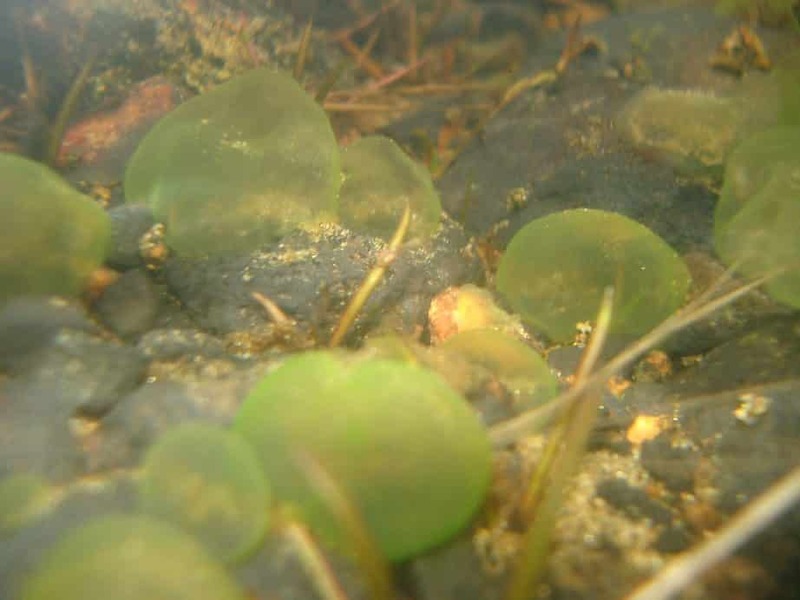 “They are constructed by a colonial stalked ciliate protist called Ophrydium, which lives, with lots of its mates, in these jelly spheres, together with symbiotic or commensal algae, usually referred to as zoochlorellae (which probably means no-one knows what they are if free-living); these give the green tinge. The individuals are quite tiny, c. 250 microns long, but they make up for that in numbers. They are normally attached to stones (don’t ask me how), but can roll about if disturbed. Technically they belong to a group called the loricate (i.e. with a protective case) peritrichs (i.e. with elaborate arrangements of ‘hair-like’ organs around their mouths). I suspect that they are characteristic of clear, clean, not very acid, not too fast-flowing waters, and appear to be distributed across Assynt in suitable habitats”. This photograph was taken on 28th March 2012 by Stevan Lockhart at the burn which flows from Lexy’s Loch at Clachtoll NC046279.